Cosmology offers today one of the most important frontiers of physics. The mystery of dark matter and puzzle of dark energy are still outstanding. On the observational side there is an exponential growth of accurate and important data, and they will help in establishing the new needed theories. 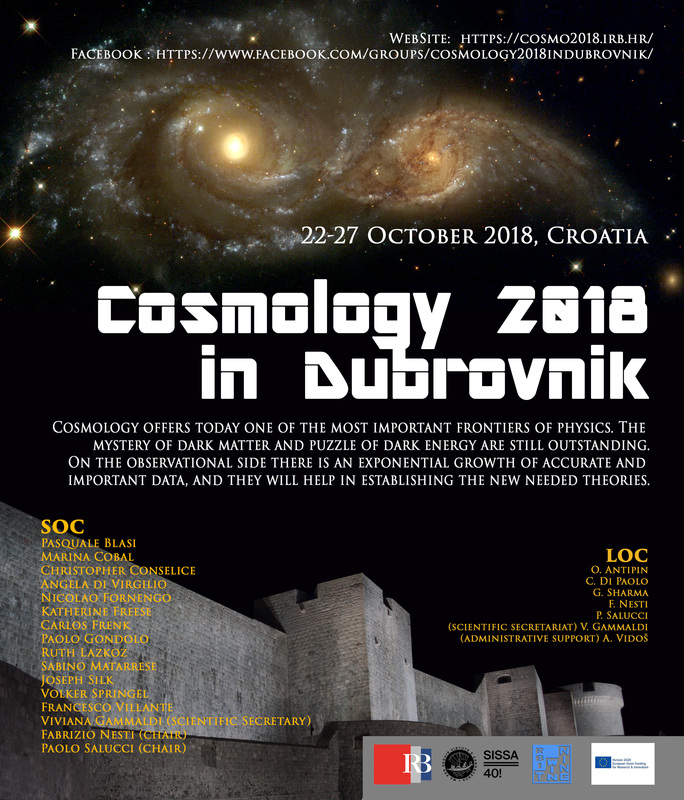 In this conference we plan to bring together researchers from the observational, computer simulation and theoretical sides working in cosmology, astrophysics and astroparticle physics, to discuss the current situation as well as prospects for the future improvements. A number of invited talks from leading scientists as well as many contributed ones from participants will be presented. The conference will take place in a conductive atmosphere, appropriate for the dramatic paradigm shift that we may be witnessing in these days. The conference is supported by the H2020 project n. 692194 RBI-T-WINNING. A conference fee of 200Eur is required: it covers Coffee Breaks, Lunches, Gala dinner. Additional support for accommodation of contributing speakers will be available in a limited number of cases.